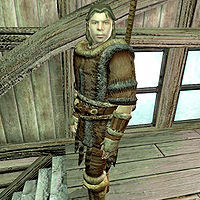 Gromm is a Nord barbarian living in Bruma, where he is employed as a manservant and bodyguard for the elderly Elf nobleman Baenlin. Their relationship goes way back and has evolved into a friendship over the years, and as Baenlin feels comfort in the presence of his friend, he has offered him a bed in his large residence in the southern part of town. Unfortunately, somebody hired the Dark Brotherhood to assassinate Baenlin, and it’s up to you to figure out how to get past Gromm. Gromm takes his responsibilities seriously, and every morning at 5am, an hour before his master wakes up, he will get out of bed and take a stroll around the ground floor of the house, making sure everything is okay. At 10am, he will go up the stairs to make sure Baenlin isn’t disturbed during his naptime and continue to keep an eye on him, following the old man around until 6pm. As hardworking and responsible Gromm may be, he needs to relax every once in a while, and at 6pm, he finally takes a seat in the small compartment next to the dining area for a few bottles of mead, leaving Baenlin to himself in his favorite chair. At 11pm, his break is over, and he will spend the last two hours on the ground floor before escorting Baenlin to bed at 1am. If he spots you sneaking around the house, he will quickly point you towards the door with various threats: "The Master doesn't like visitors. Leave this house. Now. If you're still here in twenty seconds, I will be forced to crush you. ", "For your sake, you'd better be on your way to the door. ", "Don't make me show you to the door. ", "You do NOT belong in here! ", "The Master doesn't like visitors. Leave this house. NOW." or "Why are you still here? Leave this house, before my anger gets the best of me." If you don't follow his instructions, he will shout "You had your chance, fool! Now you will never leave this house alive!" and then attack. During the related quest, Gromm will do his rounds as usual, and never even consider the giant Minotaur head above Baenlin’s chair a threat. The moment it "accidentally" falls down and kills Baenlin, Gromm will break off all his routines and just stand in front of him, in a state of shock and disbelief. Once the quest is completed, Gromm can be found practically living his life at Olav's Tap and Tack, drowning his sorrows in mead and sobbing to everyone who cares to listen: "Baenlin... Oh Baenlin... I loved ya, old man. I loved ya... But I couldn't protect ya... Oh Baenlin! Waaaahhhhh! [sobbing]"
Townsfolk feel sorry for Gromm after his master died: "Poor Gromm. I wonder what he'll do now that Baenlin is dead. Serving that old man was the joy of his life, or so I've heard." They also ask "Any idea what Gromm will do now that old Baenlin is dead?" He wears an almost complete set of fur armor: boots, gauntlets, a cuirass and greaves. His weapon of choice is a leveled warhammer. He also carries five bottles of mead and a leveled amount of gold. Accidents Happen: An honest Wood Elf in Bruma has upset some dishonest people. If Gromm never detected you while you were in Baenlin's house and you left the house within 20 seconds after killing Baenlin, Gromm will not be hostile. If, however, you were detected during the quest or took more than 20 seconds to get out, Gromm will immediately attack you. If the quest is already over and Gromm dies for any reason (for example, if you attack him in Olav's Tap and Tack), the body will vanish immediately upon his death. Esta página foi modificada pela última vez à(s) 17h01min de 7 de maio de 2013.